Based in Dallas, Rachel Watkins has been writing luxury lifestyle-related articles since 2007. Her work has appeared in “Modern Luxury Dallas” magazine. She holds a Bachelor of Arts in international relations from Southern Methodist University. From Greek to goat's milk, plain to parfaits and flavored to fro-yo, the options are nearly endless when it comes to yogurt. But this anytime treat is not just for spoons and snack time. The plain, unflavored varieties of the cultured milk product can be a healthful addition to your skincare regimen, specifically when used to make all-natural, rejuvenating facial masks that are scrumptious enough to eat. No need to book a spa appointment -- your next facial is as close as the refrigerator. 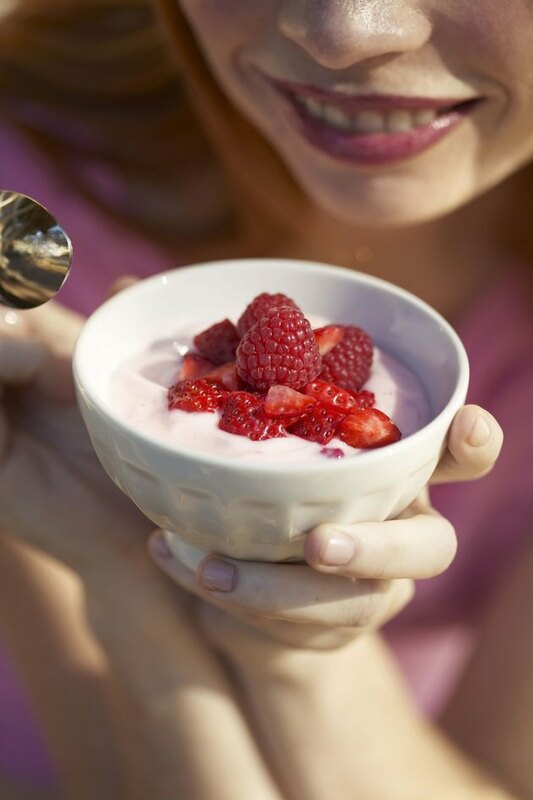 So, when whipped into a quick, do-it-yourself facial mask, yogurt can provide a natural, chemical-free and inexpensive solution to maintaining a glowing, youthful complexion. Keep in mind that it is best to skip the sugary, flavored versions in favor of plain cow's milk yogurt for these delicious recipes. To battle the elements — sun and wind — and the bodily responses they create such as sweat, Linda Collins of Salon Blue in Carle Place, N.Y. created a yogurt- and honey-based mask that softens, cleanses and soothes (See Reference 4). Simply mix 2-1/2 tablespoons of unflavored honey into 1 cup of plain yogurt and apply liberally to your freshly washed face and neck. Leave on for approximately five minutes before rinsing off. Apply the mask one to two times per week for the best results (See Reference 4). Honey is a great addition to this mask, as it is highly antibacterial and a beneficial moisturizer for all skin types, according to McAteer (See Reference 3). If you have oily skin, Collins suggests adding 1 teaspoon of lemon juice to the recipe, which will help to absorb excess oil (See Reference 4). Greek yogurt is particularly trendy right now, with its thick, luxurious texture and a delectable flavor that captivates many palates. The plain varieties can be just as tasty for your face. For a Greek-inspired facial mask, combine 1 cup of Greek yogurt with 1 tablespoon of honey and 2 or 3 drops of olive or almond oil (See Reference 2). Sweep onto your face and leave on for 20 to 30 minutes before rinsing off. The dense yogurt combined with the moisturizing properties of the honey and oil create an intensely hydrating and relaxing treatment that can deliver more radiant skin. Plain yogurt may be required for most make-at-home masks. But that doesn't mean you can't add some flavor to your facial while sneaking in a refreshing snack, too. For this two-in-one recipe, whir together 1 cup of plain (or vanilla) yogurt, 1-1/2 tablespoons of honey and 1 cup of frozen or fresh strawberries in a blender (See Reference 1, Slide 3 of 12). The strawberries add an extra dose of anti-aging vitamin C, which also fights free radicals that damage cells and break down collagen, leading to fine lines, says Ramona Ionescu, an aesthetician at New York City's Cornelia Day Resort (See Reference 1, Slide 2 of 12). Khloe Kardashian Swears by This $11 Face Mask — But Does It Work?